Seattle’s proposed University District upzone cleared a major hurdle Tuesday, as the council’s land-use committee voted unanimously to move ahead with the changes. Seattle’s proposed University District upzone cleared a major hurdle Tuesday, as the City Council’s land-use committee voted unanimously to move ahead with the changes. The full council is set to hold a final vote later this month. Seven of the council’s nine members took part in the committee vote, so approval is likely. 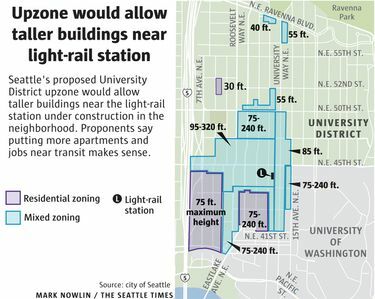 The upzone has been in the works for years, with the goal of allowing taller buildings — up to 320 feet on some blocks — near a light-rail station scheduled to open in 2021. The changes would trigger a new program requiring developers to help create affordable housing. Critics say the upzone, by encouraging redevelopment, would accelerate the displacement of poor and working-class U District residents. They say developers would replace older apartment buildings and rental homes with office towers and upscale apartments, making the neighborhood more like South Lake Union. 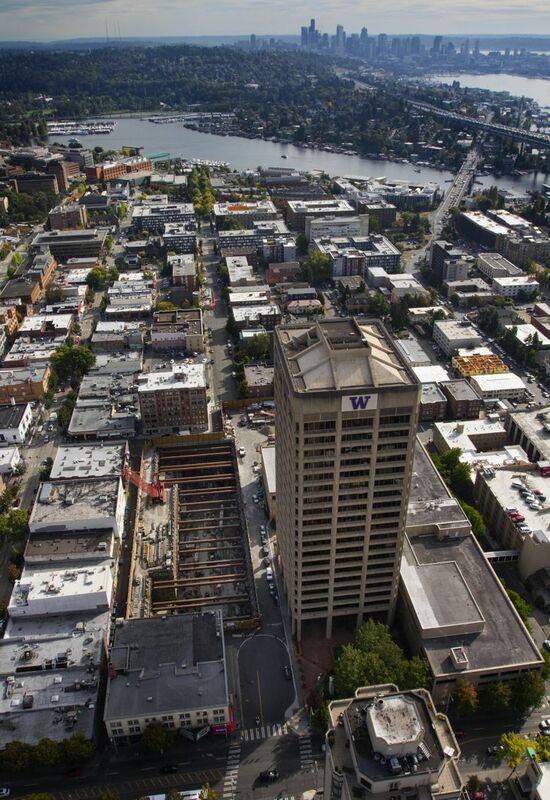 The University of Washington has pushed for the changes with the aim of turning the neighborhood into an incubator for tech startups, while some proponents say the upzone is needed to boost the U District’s housing supply. Developers are unlikely to build residential high-rises immediately, according to the city’s planning department. Market trends will likely make such projects feasible in the future, however, and the upzone is meant to guide growth for decades to come, the department says. The land-use committee amended the upzone Tuesday to carve out and postpone changes on University Way Northeast, also known as The Ave. Some owners of small businesses on The Ave are worried about the upzone and want more time to study how it could affect them. The committee voted 4-3 to add some blocks between Northeast 50th and Northeast 52nd streets to the upzone area. Councilmembers Rob Johnson, Tim Burgess, Sally Bagshaw and M. Lorena González backed the addition, while Mike O’Brien, Lisa Herbold and Kshama Sawant opposed it. The committee discussed but didn’t vote on slightly increasing the affordable-housing requirements for blocks that would be upzoned the most. The council plans to consider upzones for other neighborhoods across Seattle later this year and in 2018.